Nine First Wednesdays dedicated to St. Joseph. Every Wednesday is dedicated in a special way to St. Joseph. Make the Nine First Wednesdays [in a manner similar to the Nine First Fridays of the Sacred Heart] in honor of St. Joseph for a happy death, for yourself and your dear ones. As charity is one of the best ways to be worthy of the grace of a happy death, offer your First Wednesday Mass and Communion and devotions in honor of St. Joseph in a special way for the salvation of the dying, most especially for an undying sinner who is to lose his soul without the grace of final repentance. Our Lord permits St. Joseph to take from His Divine treasury with full hands in order to give souls the treasures of Divine grace and mercy, like Joseph, the son of Jacob, who took corn from the granaries of the King of Egypt to feed his brethren and all who had recourse to him. From the heights of Heaven, the King of Glory speaks to us the same words as Pharao spoke to the starving people of Egypt: "Go to Joseph." In the miseries of this vale of tears, to whom shall we have recourse, O blessed Joseph, if not to thee, to whom thy beloved spouse Mary entrusted all her rich treasures, that thou might keep them to our advantage? "go to my spouse, Joseph," Mary seems to say to us, "and he will comfort you, he will deliver you from the misfortunes which now oppress you and will make you happy and contented" Have pity on us, therefore, O St. Joseph; have pity on us through that love which thou didst cherish toward a spouse so worthy and amiable. We are fully conscious that we have offended the justice of God by our sins and deserve His most severe chastisements. Not what shall be our place of refuge? "go to Joseph," Jesus seems to say to us; "Go to Joseph, in whom I was well pleased and whom I had for My foster father. To him, as to a father, I have communicated all power, that he may use it for your good according to his own desire." Pity us, therefore, O blessed Joseph, pity us, for the great love thou didst bear toward a Son so admirable and so dear. Unhappily the sins we have committed call down upon the heaviest scourges: this we must confess. In what ark shall we take refuge in order to be saved? Where shall we find the blessed rainbow that shall give us comfort and hope in the midst of our afflictions? "Go to Joseph," the Eternal father seems to say to us: "Go to him who took My place on earth with regard to My Son made man. I entrusted to his keeping My Son, who is the unfailing source of grace; therefore, every grace is in his hands." Pity us, then, dear St. Joseph, pity us by thy great love for Almighty God, Who has been so generous to thee. Re: Nine First Wednesdays dedicated to St. Joseph. Someone should do me a big solid and bump this each month. "There is a prophetic figure who embodies the greatness of our saint: According to St. Bernardine, Joseph, son of Jacob the patriarch, represents in the distant past the awe-inspiring prerogatives of Mary’s spouse. You will remember the extraordinary dream in which the first Joseph saw the sun and the moon and 11 stars bowing down at his feet (Gen. 37:9). This dream was not one of those which a restless imagination conjures up during sleep; rather, it was an ecstatic vision sent to Joseph by God Himself, not only to show the imminent rise in rank of this sleeping youth, but also to point out the future greatness of our saint. I leave it to you to ponder over the unbelievable destiny of the first Joseph who saw not only his father, his mother and his brothers, but all of Egypt, prostrate at his feet. I will use this to illustrate the great dignity of the second Joseph. Almighty God, who could ever begin to fathom it! Do you not think Joseph was moved to see Jesus and Mary at his feet, as if they were servants, showing the most loving signs of respect? This is what makes me bold enough to assert that Joseph, in order to become Mary’s spouse, must have been the greatest person to have ever lived, after the Virgin herself. I don’t mean that kind of greatness in which the ambitious boast of their honors to gain the empty respect of men. If you study his lineage you will see that Joseph, not lacking such greatness, could boast of having 14 kings as ancestors, and as many patriarchs and leaders – none of them as great as he despite their scepters and crowns. According to St. Bernardine of Siena, Joseph came from a line of such illustrious nobility, reaching nearly to the heavens and including many prophets and patriarchs, that he was able to bestow earthly nobility on the Word Itself. However, it is not because of this greatness that Joseph is praised. If he has dignity in himself, it is not because of the greatness of his ancestors. His identity as a carpenter was as dear to him as the title of prince. The royal scepter was not more important to him than the workman’s hammer. His greatness comes above all from his glorious title: “the just one”. This is what pleases him most; for this he will be admired for all time. All Joseph’s glories are summed up in the eulogy: Joseph was a just man (Mt 1:19). If you really want to understand Joseph’s greatness as “just,” analyze the word itself. It sums up all the virtues and height of Christian perfection. The Holy Father of the Church, St. Maximinus of Turin, tells us the same thing: “Do you wish to know why Joseph is called just? Because he possessed perfectly all the virtues.” What more can one say about a man than to say that he possesses all the virtues to a perfect degree? Is this not the highest praise? And who could compare himself in grandeur to Joseph who deserved this praise? Could Adam who, before the fall, appeared with all the animals subject to him? Could Moses who commanded creatures with his rod? Could Abraham surrounded by his descendants like a sun in the midst of stars? Call to mind Josue stopping the sun at the command of his voice; Solomon seeing queens prostrate before his throne; and you, miracle workers, show us how nature obeys your commands. Realize, however, that all these powers cannot make you equal to St. Joseph. For you received these powers and virtues only in part, while Joseph had them all and to a perfect degree. Humble yourselves then at his feet, all you prophets, patriarchs, apostles, martyrs, miracle workers, all you great ones of heaven and earth, just as in ancient times the sun and the moon and the stars bowed down to honor the first Joseph." Sure. Ash Wednesday this year is also First Wednesday, of March, both dedicated to St. Joseph. May our holy Patriarch and Patron of the Church assist us all in making a good Lent! As he had promised, St. Joseph came again – accompanied by Jesus and Mary. His requests were similar to those of Our Lady and the First Saturday Devotion. The Sacred Hearts of Jesus, Mary, and Joseph have been chosen by the Most Holy Trinity to bring peace to the world; hence, their request for special love and honor, also, in particular, reparation and imitation. 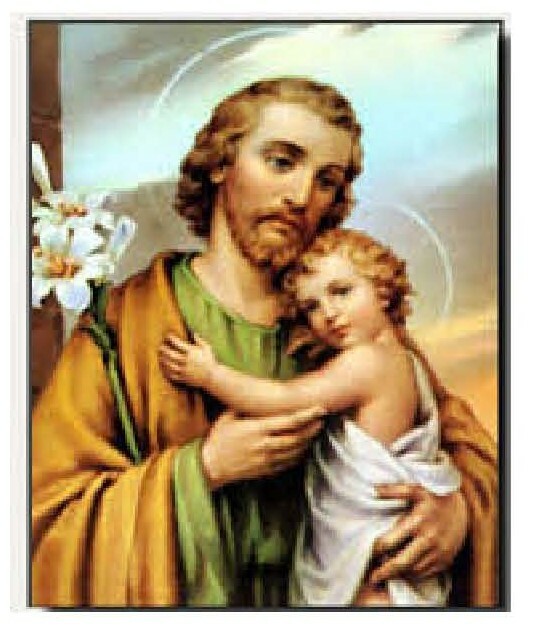 The Go to Joseph prayers are another way of honoring St. Joseph. The Catholic Tradition site mentioned in the OP shows us the spirit of the devotion: "Every Wednesday is dedicated in a special way to St. Joseph. Make the Nine First Wednesdays [in a manner similar to the Nine First Fridays of the Sacred Heart] in honor of St. Joseph for a happy death, for yourself and your dear ones. As charity is one of the best ways to be worthy of the grace of a happy death, offer your First Wednesday Mass and Communion and devotions in honor of St. Joseph in a special way for the salvation of the dying, most especially for an undying sinner who is to lose his soul without the grace of final repentance.